Ok, I know I don't update this blog very often, so let me just lay a little thing on you. I generally hate collectible games. At least, that's what I thought. I think what I really hate is collectible card games. I used to play Magic for a long time. Eventually, I got tired of needing to invest so much money every set to have a remote chance of making a decent deck, and left entirely. I decided to try other CCGs like Dragon Ball Z & My Little Pony. I left each of those for the same reasons. I respect them all as games, but I just hate the collectible aspect of it. I hate "the chase" to buy the most powerful cards. I don't like how it was required to play well. As you can see by the title, I am now playing Heroclix, which is also a collectible game. Why is this somehow the exception? Why do I still choose to invest money in this thing, especially when the player base is apparently very low? For that matter, what good reason would anyone have to get into this game over any others, especially other collectible games? 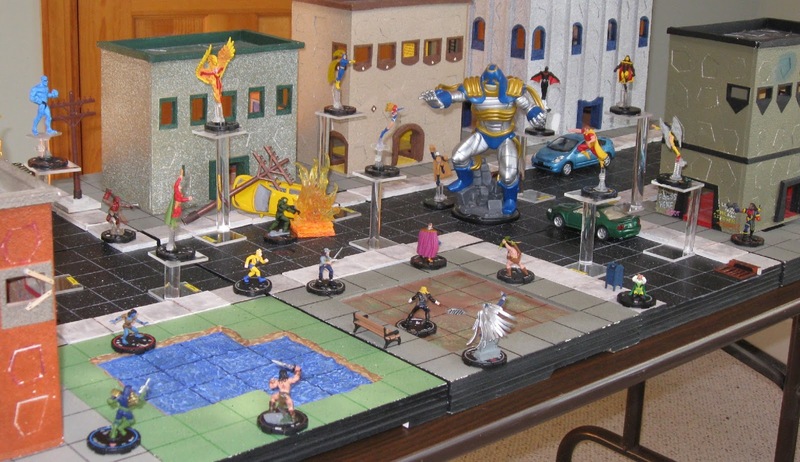 Here is my argument for why Heroclix holds a special niche that no other game can truly fill. 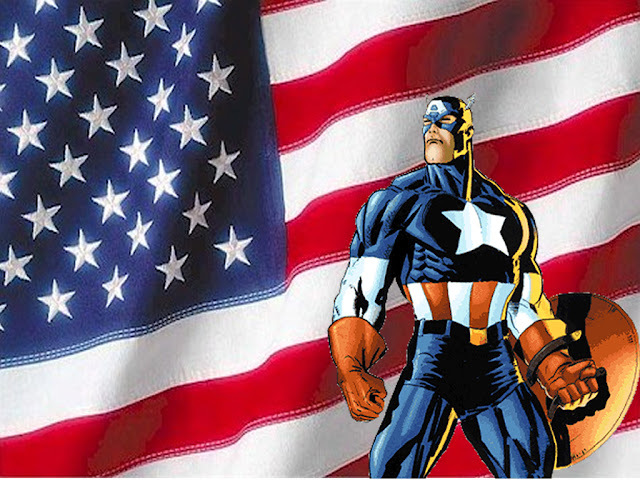 I already went on a bit of a rant for this subject at HCRealms, a very good resource for the Heroclix community. 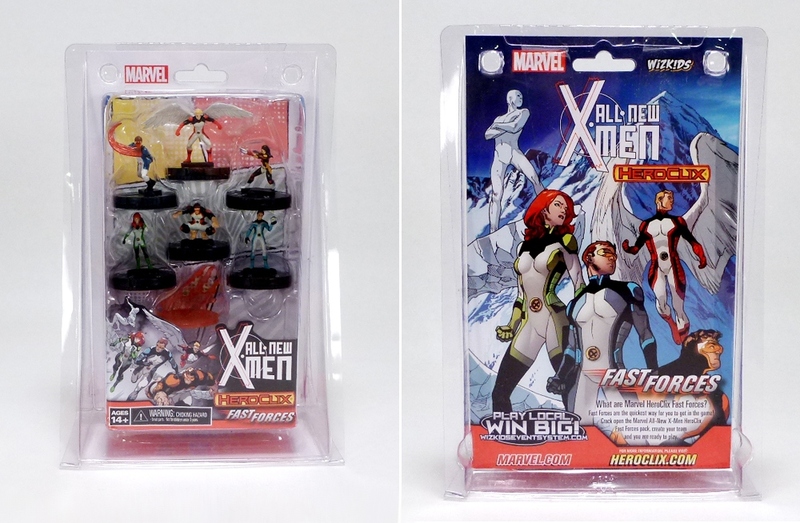 First, for those who might not understand, what even is Heroclix in the first place? 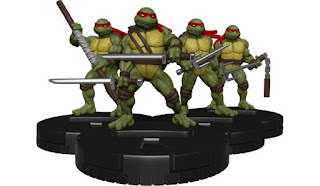 Essentially, Heroclix is a miniatures game using characters mostly from Marvel & DC Comics, though it's been known to branch out to other licenses (most recently, TMNT & Yu-Gi-Oh). It has a lot of elements you might recognize from other miniatures games like Warhammer & X-Wing: it's played on a map, you use dice for combat resolution, stronger pieces take up a bigger chunk of your team than weaker pieces, and each figure has very different abilities associated with them. 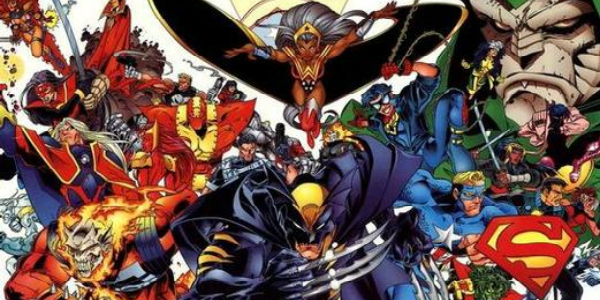 After all, just think about the X-Men & Justice League. The characters from those series have wildly different abilities, not to mention the various villains they face, and there are reasonably good representations for most of those characters. 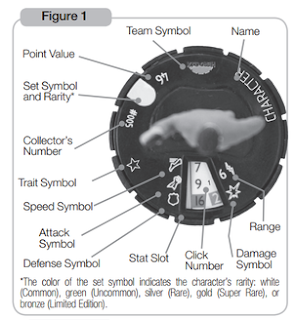 What sets this particular game apart from other miniatures is the Combat Dial system. Each figure has some specific stats showing how they work in general, and colors to show what kind of special abilities they have (like Invulnerability, Hypersonic Speed, Shape Change, etc.). If a character takes damage, you rotate the dial attached to the base 1 "click" according to each point of damage it takes. This will change the very nature of the character to some degree, usually making it a bit weaker and getting different abilities. For example, a sniper-style character might become more focused on melee when it gets hit, representing its broken gun, a now angry Hulk might get even stronger, or a character might switch to a more supporting role than a real damage-dealer. This system allows for amazing theme possibilities to it! The Deadpool character you see above starts out as a run-n-gun shooter, and he can take damage a bit better than your typical human. Once he gets smacked in the face a bit, he learns from that and starts to focus more on not getting hit than actually doing any damage, himself. 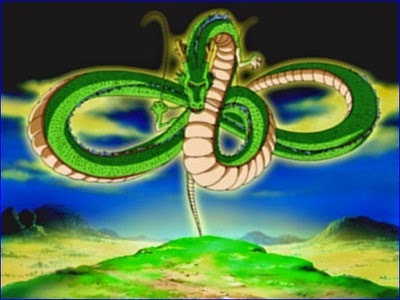 Eventually, he forces himself to stay out of combat while he tries to regenerate. So, that's essentially Heroclix. The game is unfortunately very complicated, but what collectible game isn't? When you're trying to represent all the talents of superhuman (or alien or beast) characters, that's going to take some effort. Now, why do I choose this particular game over something more popular like X-Wing, where you're piloting Star Wars ships in a space dogfight? Even if I don't actually read the comics, the superhero genre has kind of exploded lately with a lot of successful films. I've also followed some particular stories through their animated movies & shows, such as Batman & X-Men in my childhood up to Flash & Arrow now. 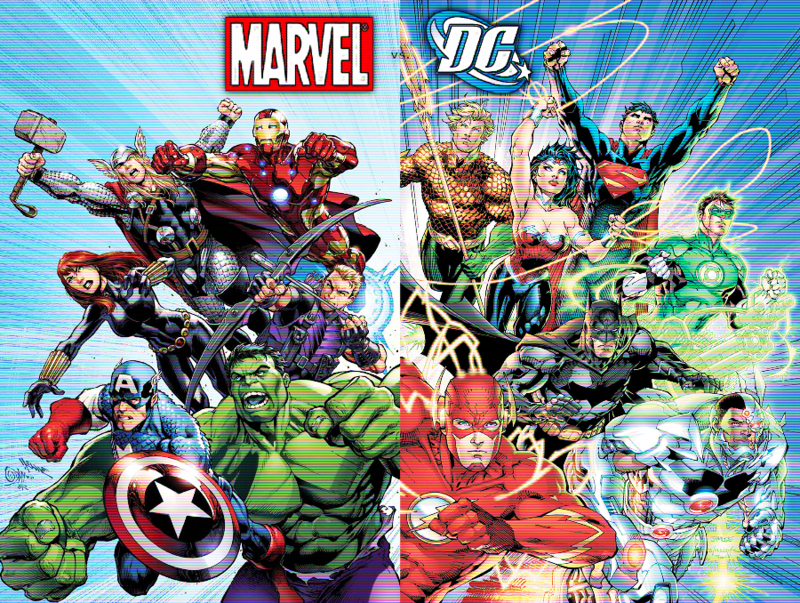 Most people can probably name at least half the characters on the above picture showing Avengers & Justice League (and if you can name them all, you deserve to at least check out the game). Honestly though, I got started with Yu-Gi-Oh. I liked the idea of a miniatures game using fantasy characters, and Yu-Gi-Oh Heroclix is perfect for that. Even if I don't necessarily like a particular character for a story (Hulk), I do enjoy effectively role-playing that kind of character. Green Lantern, and other lanterns (there's the whole rainbow) like to work by making special constructs for new abilities. Captain America works best leading a team together. Hulk smashes up close, really hard! Batman often incapacitates his enemies so they're not a threat to his normal human-ness. 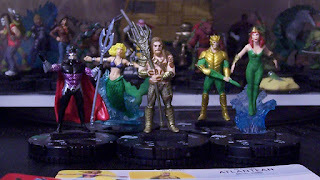 Aquaman thrives leading a team of Atlanteans in a water-based map. Thor is full of godly abilities, bringing the power of thunder & Mjolnir to honorably challenge all foes in duels of honorable combat of honor. Flash is too fast to ever be caught. 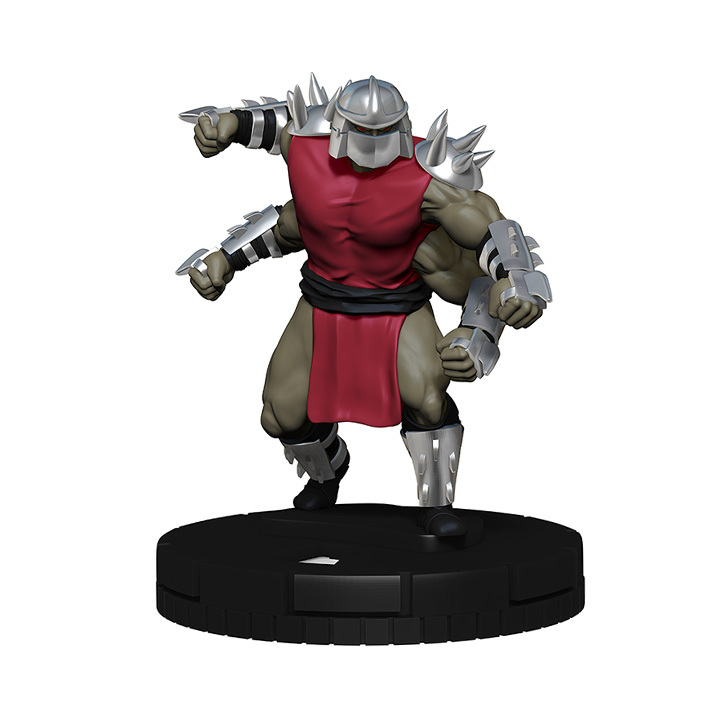 Basically, if you're a fan of any superhero, Heroclix has characters for you. As I said, the licenses are surprisingly well spread. TMNT is pretty well-represented throughout all its ages. Lord of the Rings brings a very fantasy-themed spread. Even video games have made their way in, such as Assassin's Creed, Halo, Gears of War, & Street Fighter. The multimedia success has also prompted special sets to come out actually themed more on the movies than on the comics (Age of Ultron easily has the best version of Hulk). The most recent Avengers/Defenders War includes a bunch of characters that are clearly trying to cash in on the Netflix Defenders shows. There's a Guardians of the Galaxy set for each of its movies. 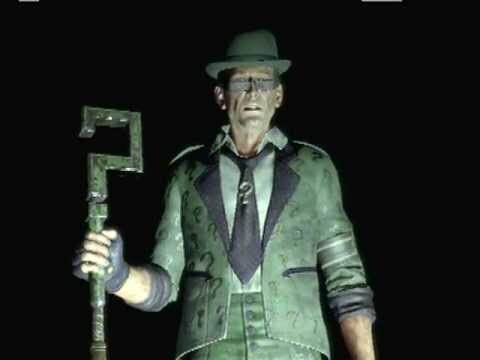 Joker's Wild has a lot of Batman enemies that are clearly based on their animated series counterparts, along with a couple themed on the Killing Joke movie that just came out around that time. If your favorite character happens to be a bit more obscure, such as Black Panther, Moon Knight, Raven, or Plastic Man, this game's got you covered, too. In all fairness, Magic does have some very impressive art. Sometimes, especially on quick spells, that art can really sell what the card is trying to do. However, miniatures bring it to a whole different level. It's nice to feel like you're controlling a horde of zombies or summon a colossal giant. It's another thing entirely when this is actually a real object you can touch and manipulate. 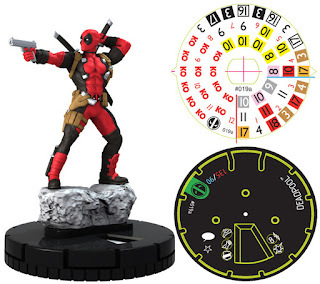 Every piece in Heroclix is already assembled & painted for you. I know for some people, they enjoy miniatures precisely for the assembling & painting. It's a craft for them. Me, I don't play with Legos. I'm willing to pay more for a finished product I can use to play immediately. 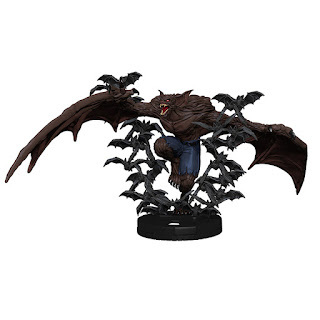 The Man-Bat figure you see above goes for a considerable amount largely because its figure is just so beautiful, even though it will barely ever see any real play. This has an added benefit, as well. Even if I can never play a game of Heroclix ever again, I still have an army of easily displayable miniatures! In effect, these become equivalent to blind bag figures, and because they're designed to stand freely while being moved in order to play right, you don't have to worry about balancing them just right. Each figure comes with a card that details what special abilities they have. These cards also come with more thematic elements that describe them, showing their real names, their teams, and other generic traits like being a martial artist, animal, celebrity, etc. Generally, each figure is pretty liberal with what keywords they'll get, so the same figure could be used on all sorts of themes. You could run a TMNT theme with turtles from all the various ages. Maybe you like Kryptonians in general, so you could have Superman on the same team as General Zod & Krypto. You could go animal-themed with a TMNT, Rocket Raccoon, Man-Bat, & Berserk Gorilla. Martial artists could consist of Batman, Black Widow, Shredder, & Legolas Greenleaf. Personally, I always force myself to create some sort of theme, just because I have so many figures now, it streamlines my picks. However, many players also enjoy toying with the idea of doing teams of characters that would never meet (or else met in some very remote fashion). Batman did a crossover with TMNT for a bit in the comics. Maybe you want Green Arrow & Hawkeye to be best buddies. Combine Hulk, Juggernaut, & Bane for a super slaughter-fest! Have Baxter Stockman do some robot maintenance on Krang & Metallo instead of his mousers. Dark Magician + Dr. Strange? It can happen! The possibilities for your dream lineup truly are endless. Characters can also have special abilities for being on certain teams, so you can make a lineup that prioritizes those special team abilities. 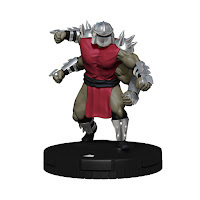 This isn't particularly unique to Heroclix. Any miniatures game uses this element to some degree, but it's still something I love about this game. For every game, you specify how many "points" you will play. This determines how large your team will be for the game. Each figure is worth a certain amount of points. For example, take a look at this match above vs. Galactus. 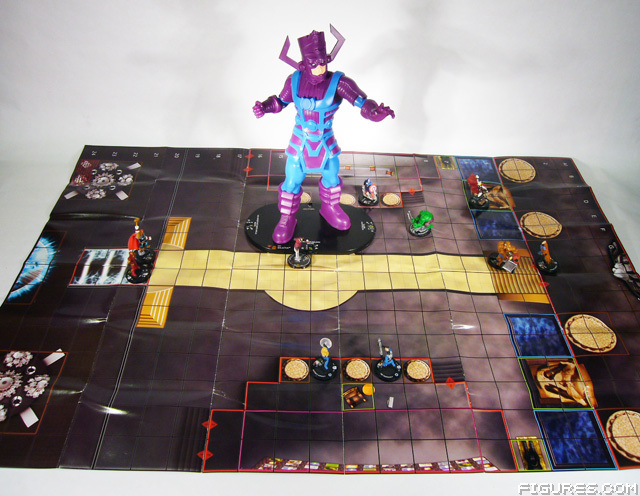 The Hulk you see on the right of Galactus is worth 128 points to play. There's a Thing (Fantastic Four) further to the right worth 100. It's pretty hard for me to make out anyone else with that zoomed-out image, but I can imagine a bunch of them run around 100 points or more. These are also heavy hitters. Care to guess how much that giant Galactus is worth? His actual point cost can vary (you can power it down for lower-point games), but he can be up to 1800 points! That means he's meant to take on the entire set of Avengers, Fantastic Four, & more for the game to be fair. Typically, the game is designed around 300. Just as an example, one could easily make a team filled with TMNT, plus maybe an ally or two. You could also run a single Hulk figure worth 300 all by himself. Alternatively, you could run a team filled with 10 generic Foot Ninjas, or 30 Joker Thugs. The bigger the character is, the more value it's going to take on your team, so ideally, the only way a team is any better than another one is how well they work together. Compare this to a card game like Magic, where you're instead given X slots for cards in your deck, and each card's power can vary wildly. Yes, each card has a particular cost associated with it, but there's ways to cheat through that. Granted, power creep inevitably happens. Most characters from the game's origin just don't stand up to the way they are today. However, that power creep really is pretty gradual. Figures from several years ago can still find their use. Lately, there's also a trend to reduce the point value of characters so you end up with larger armies. Wolverine might be the ultimate badass (he's gone one-on-one with the Hulk, after all), but he's brought down to a highly condensed, 50-point version so you can run a squad of several X-Men together. If you run a full X-Men team, none of them are going to have their truly full capabilities, but they'll all have their role. The Justice League, or more accurately, its predecessor the Justice Society was also recently represented, with most of its characters focused down to under 50 points, representing "a simpler time." Remember how I said it's really expensive to play a good deck in Magic? That can never be truly escaped in a collectible game, but it is managed very well here. 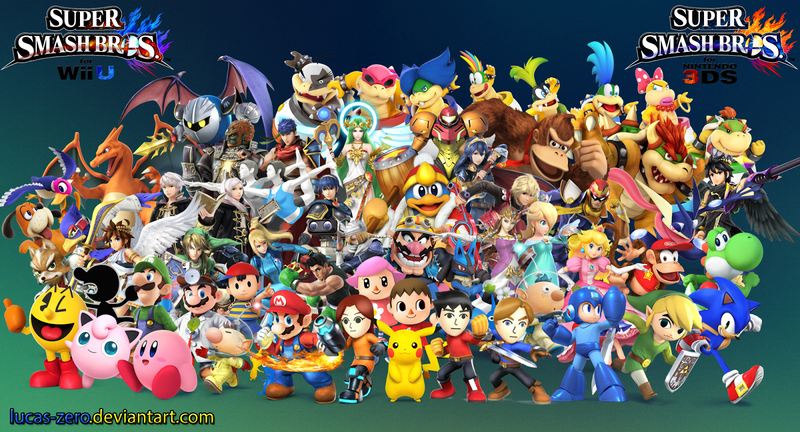 This game, with all its well-known and niche characters, is all things to all people. Because of the point system, even if all you have are commons, you can still put together a solid team. It'll probably consist of more figures than someone who has the rarer, more expensive & complicated figures, but it can work. Wizkids (the company behind the game) goes out of its way to accommodate for budget players, as well. Most sets come with at least 1 "Fast Forces," containing 6 figures relating to a particular theme, be it X-Men, TMNT, Batman enemies, Marvel Knights, S.H.I.E.L.D., etc. You don't have to buy lots of packs hoping for great figures. You can just buy these 6 that were all designed to play well together and have a blast! Even the more mainstream players often want to pick these up, because the figures inside are often really good! For example, I love the Domino from the X-Force FF so that I can get Probability Control on a figure that's really tough to kill (Probability Control lets you reroll dice you don't like). There's a Lex Luthor in the World's Finest FF that is really good at leading a squad of small figures and countering your opponent's best one. Yes, there are figures that go for >$100 on the secondary market because of their rarity & power, but a skilled player can make a surprisingly good team for very little investment. There's a common Cable figure that's seeing a tremendous amount of play for just being bonkers! Ultimately, this is the biggest argument I can make for any game. I own literally almost 1000 figures by now. In each game I play, I will probably only use 3, maybe 6 if I really want to swarm. If I want stick to just one team, that's a terrible investment. My main argument for leaving Magic & other CCGs was that all the money I spent to be able to play this one game could easily be spent buying many other games that appeal to all sorts of people! Instead of all Magic all the time, I could be playing Mansions of Madness, Epic, Catan, Bang, D&D, Chaos in the Old World, Legendary, you get the idea. Here's the kicker, though. Yes, this is all one game, but it feels like so many other games put together! This game uses characters from many different licenses, and generics aside, every one of these characters has their own great stories. You could get all sorts of games based on Avengers or Batman. I have, in fact, played many such games. However, what if instead of getting a lot of different games, there can be one game that works in all sorts of great licenses? In this one system, I have a game for Batman, X-Men, Yu-Gi-Oh, TMNT, Lord of the Rings, Street Fighter, Gears of War, and more. This same game involves vampires, aliens, robots, gods, gangsters, soldiers, ninjas, zombies, and so much more. All of these use the same system and they all work together! Smash Up's greatest draw is that you can take a couple things, like dinosaurs & pirates, merge them together to make dinosaur pirates, and you're ready to play! This game does exactly that, but I can make this game into whatever game I want, whatever scale I want! I can recreate Batman: Arkham Origins if I want. I can have a completely nonsensical mashup of Michelangelo teaming up with Deadpool and Joker if I want. I can fight low-level street crime or make an epic battle of the ages! We can fight in the Nile River, Gotham City, Atlantis, or even literal asteroids in space. I can, and have, give the power of the Phoenix to the TMNT fighting outside Comic Con! The Gate Guardian made short work of Superman & his friends. There are just so many scenarios of games I can design. This is not simply one game, this is thousands! I can already hear the protests. "You're bashing Magic so hard, but what you're describing can still happen there. The combinations are endless!" Sure, and there is definitely some lore to Magic. I ask though, how often does that lore truly come up in each game you play? When's the last time you ever actually felt like a wizard when playing it? Can you really describe what kind of relationships your various characters & creatures have with each other? Yes, there are lots of Magic books, but for most people who read them, the interest goes the opposite way. You read Magic books because you like the game Magic. I play Heroclix because I already like the characters it depicts. I can conceive of special circumstances that would bring these people together. Why are Batman, Two-Face, Penguin, & Jim Gordon all working together? Because the one thing that unifies them is their love for Gotham City, and NOBODY MESSES WITH GOTHAM BUT GOTHAM! The ability to cross over should never be underestimated either, as we can see with the many Marvel Vs. Capcom games that have come out over time. There are just too many good things that all come together here. I love the characters. I feel invested in them as I play. I can position figures in just the right ways for careful precision strikes. 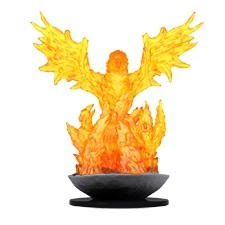 I can witness the action playing out in front of me as characters maneuver around bushes, blast through walls, bash their enemies with a freaking ship anchor, knock their enemies off rooftops, and witness the power of the Phoenix Force flow from one defeated member into all the others. I said it before, this game is all things to all people. The game is overwhelmingly complicated, but my love for these characters, these icons, is strong enough to see me through. Magic has some great art, but the cards themselves are very difficult to display outside of playing the game. Dragon Ball Z is a great system, but it's just Dragon Ball Z. Yu-Gi-Oh has a lot of creative monsters, but I hate the game's general design. Heroclix just gets so many things right, it has become the perfect game for me. There will eventually come a time when I have collected all the characters I like, and then it will be a question of whether I prefer the new versions they introduce (there have been so many Batman representations over the ages). Maybe my investment will stop there, but there are so many stories yet untold through this game, I'm optimistic for the long-term. FROM SEA TO SHINING SEEEEEEEEEEEAAAA!!!! !